Sol Andino is situated in the center of La Paz! We welcome backpackers, families and tour groups from all over the globe. We are within walking distance to many must-see landmarks of La Paz, including la Plaza San Francisco, the witch's market and Calle Sagarna, Plaza Murillo (main square). 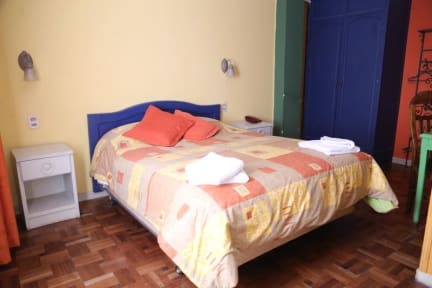 Rooms are cleaned daily and supplied with fresh sheets and towels when you arrive. A buffet breakfast is included in the price of the room. There is 24 hour Internet access available in the lobby and some room have WIFI. I have only good things to say about this hotel. The staff were very friendly and helpful, the location is very good and the room was clean and comfy. The breakfast is simple but good and there is a rooftop so you can see La Paz from above. Definitely recommend!! Nice showers, great water pressure, great staff, warm blankets, great location. Booked for two nights and stayed for 5 in the end! The staff are lovely and really want to make you enjoy your stay in La Paz. Good laundry service and a nice breakfast. Room was clean and nicely decorated but a bit chilly. Lovely terrace with great views and a pool table. Located just off the main street leading to the witches market and some great restaurants. If they had a kitchen to use it would be an almost perfect hostel, but then again Bolivian food is so cheap you can just eat out! We didn’t actually stay here, as we mistook the sister-hotel for being the hostel, but I’ve heard the two are quit similar. The hotel has huge private rooms, comfortable beds, hot showers, delicious breakfast with panoramic view over La Paz and a staff that really goes the extra mile and take their time answering all your questions. I recommend! Great hostel - very helpful staff, comfortable beds, and very convenient and mostly quiet location. The breakfast is a typical Bolivian tourist breakfast - bread, yogurt, coffee, jam and fruit. Hotel registered as a hostel type. Its really clean and nice. They are located near pretty much all the good places. Only gripe is that despite having.4 different types of wifi, it would not work in my room. This is not a serious business. Avoid this Hostel! 6 of us showed up on the Bolivia Hop Bus at 10:30 PM, all of us had reservations. All our rooms were given to others, so we didn't get to stay here. They sent us to another Hostel near by, which was Estelle Andina, which it seems are affiliated with Sol Andino. Our stay at Estelle Andina was very good, and the breakfast was the best we have experienced in a hostal anywhere in South America.